Taganga is situated on the Caribbean coast of Colombia. It is a fishing village but also a neighborhood of the city of Santa Marta that lies at 5 km on the other side of the hills. 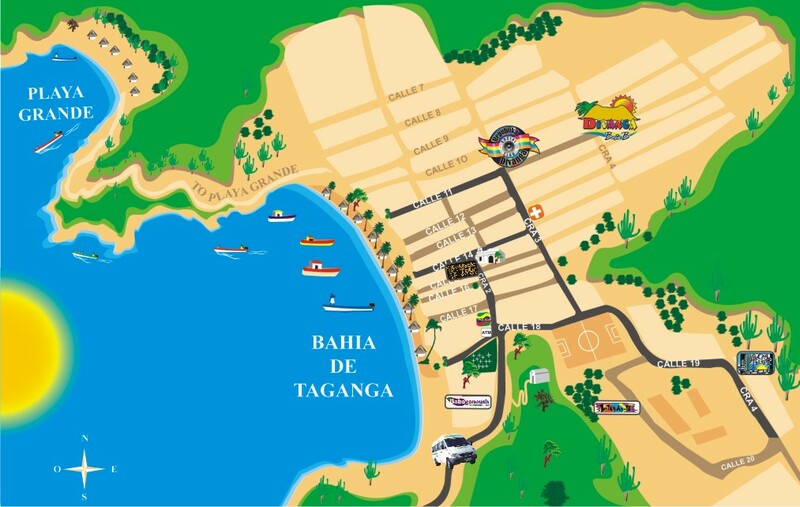 You can reach Taganga in 15 minutes from downtown Santa Marta by public transportation. Divanga Hostel is located at the heart of the community, at only 5 minutes’ walk from the beach one block up from the main road. From all major cities of Colombia. Buses offer excellent quality, are generally on time and are now the most common way of traveling in Colombia. To Santa Marta airport arrive national flights from Bogota, Cali or Medellin. The traffic has increased over time and the prices allow traveling by this mode of transport. There are shuttles with air-conditioning that can be booked at most hostels in Cartagena. They leave all the day long from 6 am to 4 pm.